The 200-05108-45 Wind Monitor-HD-Alpine combines the features of the Heavy Duty unit along with the ice-resistant coating of the popular Alpine Wind Monitor. 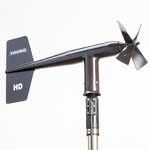 Robust, reliable, durable... all words to describe the latest addition to the Wind Monitor line. The HD-Alpine utilizes extremely long-wearing, oversize ceramic bearings to increase service life many times longer than standard stainless steel bearings. In addition to being more wear resistant, ceramic is resistant to corrosion in environments that are hostile to steel bearings. The Wind Monitor-HD-Alpine also has an oversized propeller shaft, high pitch propeller and locking propeller nut, all features that will further enhance long-term reliability of the sensor. All external housing surfaces are coated with a specially formulated, ice-resistant coating to improve performance in harsh Alpine conditions. The all-black color scheme further enhances the ice shedding performance of the sensor. For specific applications, separate signal conditioning is available. Model 05608C Wind Sensor Interface offers calibrated voltage outputs for wind speed and direction. Model 05638C Wind Line Driver provides calibrated 4-20 mA current signals for each channel. Each circuit is supplied in a weatherproof junction box with mounting hardware.